The billboard appears to suggest that comedian Jerry Seinfeld is the star of the show, and that the program may focus on his life in some way. CHICAGO—City commuters reported a mixture of surprise and excitement this weekend after passing a billboard informing them of the existence of a situational comedy titled Seinfeld, which evidently stars stand-up comedian Jerry Seinfeld. According to the billboard, the program, which many commuters speculate could be based on the observational comedy of Jerry Seinfeld, would air back-to-back episodes on weeknights at 9 and 9:30 p.m.
“I hope the show is a success,” she added. Commuters told reporters that based on the button-down shirt and sweater vest the comedian is wearing in the advertisement, it appears as if Seinfeld takes place in the 1990s, and that the program will be centered around a Jerry Seinfeld–like character. 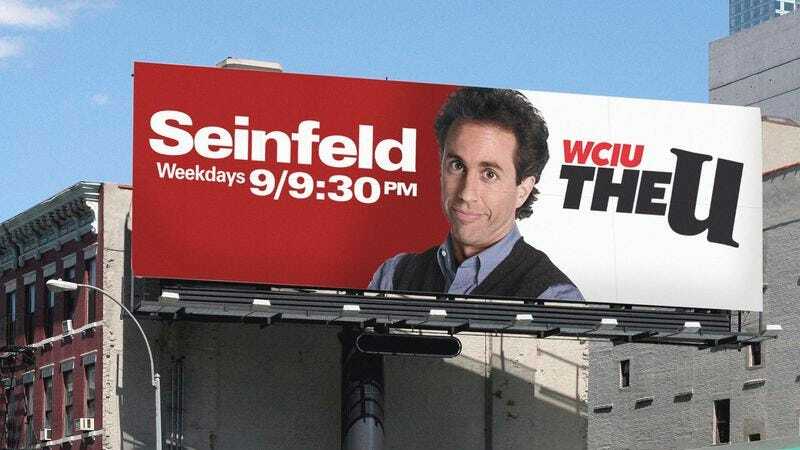 Sources speculated that while it is fairly clear—based on the way Seinfeld is crossing his arms—that the show is a comedy program, the billboard didn’t make it entirely apparent what Seinfeld’s occupation would be. Various commuters said that his job could be anything from a wisecracking attorney, to a newlywed, to a stand-up comedian, or a shop owner of some kind. Commuters also said it was unclear from the billboard if Jerry Seinfeld’s name in the television series would be Jerry Seinfeld or if the stand-up would have a different first name altogether, like Mark or Eric. Sources nationwide confirmed that the Chicago-area billboard is just one of many advertisements for the Seinfeld-inspired situational comedy. A second version of the advertisement, seen in many cities throughout the country, reportedly features Seinfeld pictured with a bespectacled, balding man, a dark-haired woman, and a second taller and more frazzled-looking man, all of whom are hugging one another, leading many to conclude that these individuals are also characters in the show and may be part of Jerry Seinfeld’s fictional family, the Seinfelds. The presumed existence of a cast prompted many onlookers to abandon their previously held belief that Seinfeld was actually a talk show hosted by Jerry Seinfeld. A third sign, which shows a wild-eyed Seinfeld clutching his hair with both hands, fueled speculation amongst many drivers that the show’s comedy would be broad, zany, and feature the Jerry Seinfeld character dealing with numerous madcap complications that frazzle him. As of press time, commuters in cities throughout the country were also scrambling to learn more about another new television program entitled King Of Queens, which seems to be about a stocky delivery man and, according to numerous billboards, is also adopting the same grueling five-night, 10-shows-a-week production schedule.